We are going to learn Bank Reconciliation in Tally because Bank Reconciliation Statement (BRS) is one of the major accounting treatments or we can say major accounting processes that needs to be done. In this post we are going to discuss bank reconciliation in Tally step by step. If you are doing accounting for a business or a firm which is under the scope of audit then BRS is of a major importance in itself. But, let me say that preparing BRS is a tedious task. I have prepared BRS of a 1,000 page bank statement without Tally and I exactly know how it feels to do it manually. By downloading e-statements you can easily match the dates in your books of accounts and in the bank statement daily and record them in Tally. I think this is the best way of reconciliation as it reduces workload at the end and every day less entries have to be reconciled rather than bulk of entries at the end of an accounting period. Today, you are going to learn how to do bank reconciliation in Tally. It is very simple and easy to do so. Before moving ahead, there is a clarification for you. There are two types of bank reconciliation in Tally. In this post, you are going to learn the manual approach. Because, once you learn the manual approach you will automatically learn the automatic approach. Trust me! Manual approach is useful only if you are passing entries daily or you are not having more number of entries to be passed. Otherwise as said before it is a tedious task and you will get easily bored. Bank Charges – This entry is a simple payment entry. This entry is about paying bank charges from your bank account. Bank charges are normal these days are charged to your bank account directly. They are automatically debited from your account. They are usually debited for using banking services such as cheque book printing, new card issuance, SMS alerts and so on. Here is the picture of the entry of what it looks like in Tally. Another entry is about payment to a creditor named INB Avenues. Payment to Creditor – It is yet another payment entry but this time to a creditor. This is a common entry in every business. You purchase goods from creditor and then you pay it at a later date. Here is the picture of this entry in Tally. Have a look at it. I have used bank account (SBI) in both the entries because I am trying to make you understand what exactly bank reconciliation in Tally is. I have already created both of the above entries in Tally as this is not a post explaining creating entries in Tally but is a post on bank reconciliation in Tally. Now, we are going to look at the actual bank reconciliation step by step in Tally. From Gateway of Tally, select Banking option as shown in the picture below. Now select Bank Reconciliation from number of options as in the picture below. After you press Enter on the Bank Reconciliation option, you will see a list of all the Bank Ledgers in Tally. This means it will show you all the bank accounts which you have created in Tally. 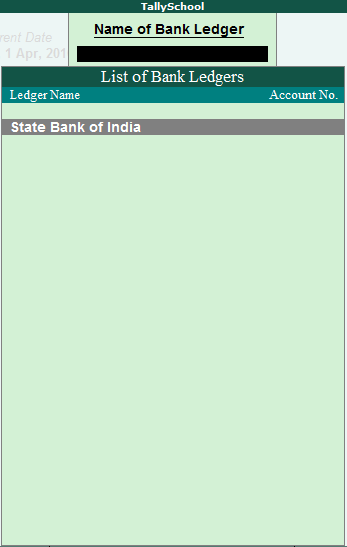 Here is the picture which shows State Bank of India in the list of all bank ledgers. 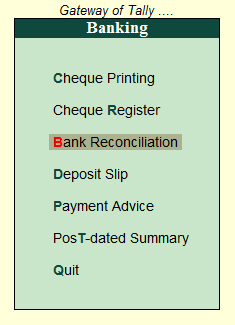 Select the bank from menu for which you want to do bank reconciliation. In this case we are going to select State Bank of India. Now, you will see all the entries which are NOT reconciled in Tally. This screen is called the Bank Reconciliation screen. We have to enter the Bank Date in order to reconcile the bank statement. This is actually in effect bank reconciliation. Bank reconciliation is required when there is a mismatch in the date of particular entry in your bank statement and your books of accounts. That is the reason we have to enter the bank date here in Tally to account for the differences that arise due change in dates in your bank statement and your books of accounts. Now, let’s look at the entries and complete the bank reconciliation process. First entry is about Bank Charges. Bank charges are automatically deducted from your bank account. Therefore there is no question of different dates being entered in the books and the bank statement. So, the date is same in both the books and the bank statement. And, therefore in the bank date column we will enter the same date as it is in the first date column. Now, we will move on to the second entry which is the creditor entry. Here is where the real reconciliation comes in to play. Let us assume that you paid to the creditor INB Avenues on 01/04/2016 but the bank credited the cheque in the account of INB Avenues on 02/04/2016. As both the dates are different, there is a real requirement of reconciliation. In Bank date column, we will enter the date as 02/04/2016 to complete the reconciliation. Have a look at the picture below and you will know what I mean. This is what it looks after you have entered the date in Bank date column. Now just press enter and the bank reconciliation is over. Bank reconciliation in Tally has been done but what about the Bank Reconciliation Report or in short BRS Report in Tally. I will explain it to you in a step by step approach right now. Once you have completed the bank reconciliation in Tally, you need to print the Bank Reconciliation Report in Tally. It is a report which is the link between your account books and the bank book or the bank statement. It is very easy to create a BRS Report in Tally. From the above steps, go to the Bank Reconciliation option in Tally. You will see all the reconciled entries on this screen. Now you just have to press ALT+P or click on the Print option at the top left corner of the screen. As soon as you do any one of the above things, you will see the printing options on your screen as shown in the picture below. Now press N or Backspace to change the options. If you do not want to change the options just press Enter. Set Yes in the 4th option – Show Reconciled Transactions also which is by default set to No in Tally. By setting the 4th option to Yes, Tally will show all the entries which you have entered while reconciling the statement. After pressing Enter, here is what the statement will look like. As you can see, all the details are clearly printed in the Reconciliation Statement. This statement is required by many people in daily accounting for matching the differences between the accounting books and bank books. Note the difference of dates for the transaction of INB Avenues. The date is 01-04-2016 and Bank Date is 02-04-2016. It is the difference of dates and hence the reconciliation is required. ₹1,000 is not reflected in bank because the entry for it is done in bank on 02-04-2016. This is what a bank reconciliation process in Tally looks like. Now have a look at the video tutorial below and see the exact process of reconciliation. I will be producing the second part soon in which you will learn the automatic approach of bank reconciliation in Tally. Till then stay tuned on TallySchool. 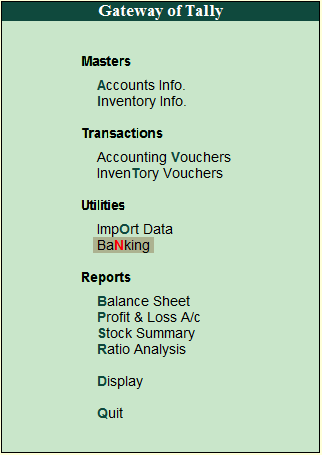 Update: Bank Reconciliation in Tally - Part 2 has been published. A question for you at the last? Did you really learn bank reconciliation in Tally by watching this tutorial? Answer it in comments. I’d love see your answers. Currently i m using Tally Erp 9, Here i m unable to find the Banking option in Gateway Of Tally. How i activate this option. Banking Option is available on Gateway of Tally(GOT). But still if you are not having it, you can enable it by pressing F11 from GOT. Then go to Accounting Features. Now select Banking Features and enable it. Your version of Tally needs to be updated as the previous versions didn’t have those features. Thanks for bank reconciliation show it was helpful. I have following question regarding Bank reconciliation. I have following 4 entries in tally for the same date. I hope am clear with my question. Thanks again for your wonderful articles. When you import the bank statement, you will see the list of entries which needs to be reconciled. Select the entries as per your wish. So, you can select the entries from the list as per your requirement. Then go to Bank Reconcilation. Now press F12 and select Yes against the option Show all Unreconciled transactions till date. I have paid to INB Avenues on 01-04-2016 but the cheque got credited in their account on 02-04-2016 and this is where we reconcile the bank statement. I hope you now understood. Can any one tell me the Bank Recounciliation of a compound entry in Tally? What do you mean by a compound entry? Now while doing bank recouncilation in tally it is showing only the first name i.e salary to mani with a total amt of rs 1000.Thats why i have asked how to split entry in order to get individual names in recounciliation. In Tally, although it may show Salary to Mani, the effects of the entry to the respective accounts in Tally i.e. Salary to Mani and Salary to Sai will be there. About bank reconciliation, it shows ₹1,000 only because that is what matter for bank account as you have passed a single compound entry. If you want individual names in bank reconciliation, you need to pass two different entries. But as I said, the effects of both the accounts of Sai and Mani will be there in Tally although it shows only one name while reconciliation. What problem are you facing Abhishek? Hi, Thanks for sharing useful information on BRS. can u please explain it with more accounting entries like a fully fledged question. Yes, I will post the updated post soon. Thanks for sharing useful information on BRS. Can u please share a full fledged question with more entries. I will post the updated post soon. How to show cost of raw material consumed in P&L statement?? The effect is already there in the profit and loss account because with the raw material consumed, you must have produced finished goods. And, for raw materials, you must have had opening stock or purchased it. So, in effect there is cost of raw material in the profit and loss account. I have answered it. Sorry for late reply.